Can the Lumia 920 offer the standout Windows Phone 8 experience? 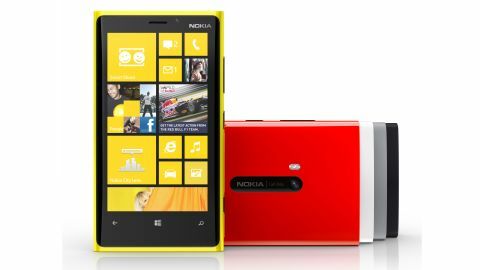 The Lumia 920 was the most feature-packed of the initial Windows Phone 8 line up, as Nokia looked to regain its dominance in the WP market and ride the new OS wave to success. Since its launch in 2012 though, the company has superseded the model twice, initially with the Lumia 925, and more recently with the impressively specced Lumia 1020. But despite more advanced models coming to the market, the Lumia 920 still manages to hold its own in a crowded marketplace, with impressive specs and a now reduced price point. Available outright online for as low as $350, or for $0 up front on a $66 plan with Telstra, the Lumia 920 has quickly become an affordable premium device for anyone looking to spend time in the Windows Phone ecosystem. The handset itself follows on from the design of the Nokia Lumia 800 and Lumia 900, the latter of which is the natural predecessor of the Lumia 920, offering up the Finn's big-screen Windows Phone experience. Front on you'll be hard pushed to tell the difference between the Lumia 920 and Lumia 900; however the newer handset has a smaller bezel above the screen, but a larger one below it. It's a strange decision and if we're honest the additional space below the three touch buttons; back, Windows and search, seems a little unnecessary - reminiscent of the Motorola Razr. The Lumia 920 is pretty big as far a smartphones go these days measuring 130.3 x 70.8 x 10.7 mm, with the unibodied polycarbonate chassis providing a sturdy, premium finish – however its weight is noticeable. Tipping the scales at 185g the Nokia Lumia 920 is unmistakably heavy, especially if you're coming from the 112g iPhone 5 or 133g Samsung Galaxy S3. And while the weight may be a shock to start with we did become accustomed to it, and after a few days use it was honestly no longer a real issue – however those with smaller palms may still find it a bit of a struggle. The rounded sides of the Lumia 920 make for a smooth, comfortable hold, as long as your hand is big enough to wrap round the handset, and with the physical keys all located on the right hand side, they're relatively easy to hit. On the right there's the volume rocker switch, followed by the power/lock in the centre and a physical camera shutter button towards the base – a rarity among smartphones these days, but something Windows Phone handsets stick with. The main feature on the front of the Nokia Lumia 920 is the 4.5-inch IPS TFT screen, which provides a crisp, bright display offering up an HD resolution of 768x1280. It's not quite as large as the 4.7-inch display on the HTC One X+ or the 4.8-inch Galaxy S3, but it is one of the biggest Windows Phone 8 handset currently on offer, with the Windows Phone 8X clocking in at 4.3-inches. On top there's a centralised 3.5mm jack, which Nokia claims makes it easier to slide into your pocket when you have headphones plugged in (it's certainly a better position that the side location on the Nokia N95), next to a microSIM tray which requires a little tool included in the box to pop open. The presence of the SIM slot reveals there's no access to the 2,000mAh battery housed inside the Lumia 920, plus there's no SD slot to expand on the 32GB of internal storage. The left side of the Lumia 920 is an uninterrupted slice of polycarbonate allowing you to marvel at the beautifully curved edge. On the bottom you have a microUSB port flanked by a couple of speaker grills and two exposed rivets, similar to the ones on the base of the Google Nexus 4 and down the sides of the Motorola Razr i. Place the Lumia 920 face down and it becomes even more difficult to differentiate it from the Lumia 900, with the centralised 8MP camera lens, sliver plate surround and dual LED flash the only features on the back. The only clue that this is a different handset is the word Nokia in large text on the sliver plate, instead of Carl Ziess on the previous model, which has now been relegated to a smaller font next to the firm's name. The matte black finish on our review model completes the minimalist industrial design, with the Lumia 920 is also available in grey, white, red and yellow which sport a glossy finish which we reckon looks a bit cheap. As long as you can get over the size and weight of the Nokia Lumia 920 - we did after a few days - you'll find it's a robust device which certainly feels premium in the hand, with possibly only the iPhone 5 feeling classier.